Designed by 2K/Denmark, printed and bound in the Netherlands by Royal Jongbloed, the Schuyler Quentel sets a high standard for the modern reference edition. 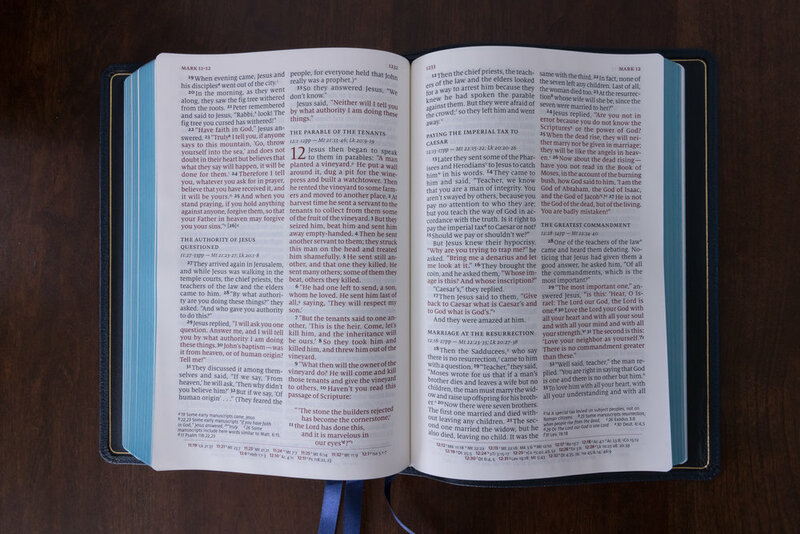 The layout pushes readability about as far as possible while holding onto familiar conventions like the double-column text setting, chapter and verse numbers, cross references, and red-letter presentation of the words of Christ. The print impression is crisp and dark. 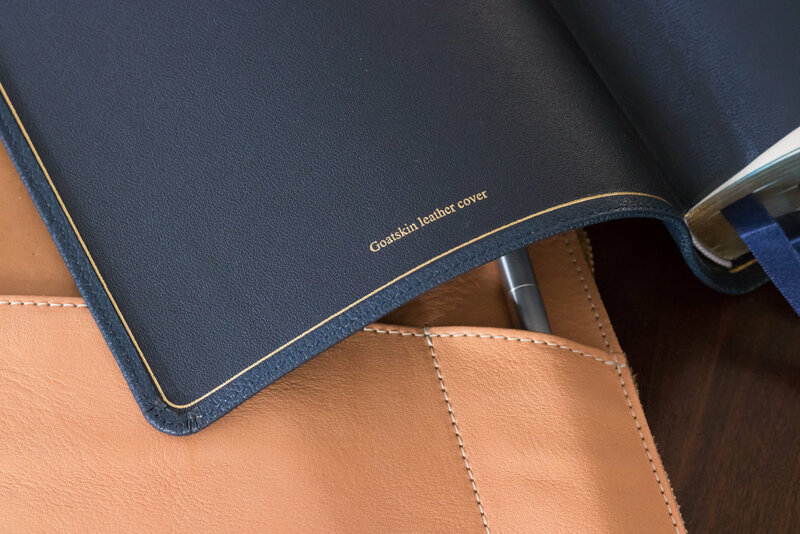 The leather-lined goatskin binding feels limp and luxurious in your hands. In addition to offering the Quentel in a variety of translations, Schuyler has also expanded the line by introducing compact editions — dubbed the Personal Size Quentel. You can have one for the desk and one for the road, in whichever version of the English Scriptures you prefer. If that’s not enough, Schuyler has also introduced a thinline Quentel, changing the paper spec from the usual 36 GSM PrimaBible to a thinner 28 GSM sheet. The Quentel featured here is one of the standard editions — neither compact nor thinline — yet it does introduce a new translation to the stable, the 2011 New International Version. It also features a new approach to printing the red letters. My review copy is bound in Imperial Blue Goatskin with a handsome navy leather lining accented by a gold foil line around the perimeter. There are three blue ribbons, each measuring a full centimeter in width, to mark your place. While most premium editions feature red-under-gold gilding on the page edges, this one comes with blue-under-gold to complement the cover. Left: The limp goatskin binding rolls back easily, making the Quentel easier to manage with one hand. Right: The Personal Size Quentel (top) compared to the Quentel NIV (blue) and NKJV (brown), as well as the thick original Quentel NASB in scarlet (bottom). Twenty years ago, the riot of color once available in leather-bound Bibles had dwindled down to two main options, black and burgundy. Over the past decade, we have seen the re-introduction of scarlet and tan, of purple and green and brown and blue. I love the variety that has now become standard, and hope we will see even more options in the future. Black remains a perennial favorite thanks to its conservatism and class elegance, but a dark blue binding like this one offers an alternative that still possesses a degree of formality. Royal Jongbloed knows its way around an edge-lined binding, so the Quentel opens flat and has a limp cover that conforms to the hand. Once you are familiar with edge-lined bindings, you take this flexibility for granted, but it is probably the most striking feature to anyone new to the world of quality leather Bibles. Out of the box, these bindings have the ease of a well-worn glove, which makes them a delight to handle as you read. I prefer single column text settings, even in a reference edition. In my ideal world, the Quentel would have more of the design DNA of the Cambridge Clarion. But Schuyler understands that one of the keys to viability in a niche market is choosing your fights. They tend to be traditional on the whole when it comes to design. They settle on popular options and then focus on executing them well. Double column text settings are the norm for Bibles. They are easier to get right than single column settings, too. So the Quentel plays it safe, in one sense. But the execution makes it seem anything but. Left: Zondervan now offers a number of interesting editions of the NIV, including a single-volume Reader's Bible and a four-volume Reader's Bible dubbed the NIV Sola Scriptura Bible Project. Right: The Schuyler Quentel offers a classic double-column, red-letter NIV. Mike Abbink began work on FF Milo in 2000 with the goal of creating a compact typeface with very short ascenders and descenders. Because of its compact design FF Milo is a workhorse typeface suitable for magazine and newspaper typography. It has modern bones with a touch of detail for distinction (especially in the italics). In a typeface like Times New Roman, the uppercase L is roughly twice the height of the lowercase e. But in Milo, lowercase e is just a shade shorter than uppercase L—and lowercase t is the same height at uppercase L, whereas in Times New Roman it is just a shade taller than lowercase e. What does all this mean? Simply put, 11 pt. Milo will look bigger on the page than 11 pt. Times New Roman. Despite the two being the “same size,” your eye will tell you the type set in Milo is larger. That’s why a Bible designer will gravitate toward a typeface like Milo instead of favorites of mine like Adobe Caslon and Adobe Garamond. There are a lot of words to fit on the page, and a compact font makes them easier to read. Every Quentel is set in the Milo type family, but the NIV innovates on one particular front, which is the handling of red letter text. As I mentioned above, Schuyler takes into account the desires of traditionalists, and there is no tradition more divisive these days than red letter Bibles. For one thing, the tradition does not go back as far as most people assume. It was an associate of the evangelist D. L. Moody in the nineteenth century who first opined that setting off the words of Christ in red ink would be a pious touch. For the last hundred years or so, the practice has been so popular — at least in the United States — that people look sideways at any Bible that doesn’t have red letters. Personally, I dislike red letter editions. They imply (without meaning to) that the red letters are more authoritative than the black. Columns of red ink are also harder to read. Always assuming they are red. Some of the vintage red letter editions on my shelf are closer to pink letter, or terracotta, or even orange. But as I said, the Schuyler way is to execute traditional in the best possible way, and this is no exception. When they offer red letter editions, they scrutinize the print impression to make sure the red is dark, even, and readable. In this NIV, they have gone a step farther by setting red letter text in a slightly heavier weight, Milo Semibold. There is an upside to the choice, as well as a downside. The upside is that the red text is that much easier to scan. The downside is that, in lines that combine both black and red letters, the difference in weight is perceptible. It doesn’t jump out at you, but once you notice, you notice. These liturgical instructions give curses to be recited by the Levites, each of them followed by a refrain from the people. The NIV indents each curse as a new paragraph, then separates the refrain, justifying the new line against the right margin. I understand what they were going for, but in the double column setting all that results is visual chaos. Unfortunately, this is not one of those instances where switching to a single column fixes the problem. In the photo above, you can see the same passage in the NIV Sola Scriptura Reader’s Bible, and I actually think it looks worse. Better to keep each curse and refrain in the same paragraph, as the ESV and NASB do … or give the designers freedom to adapt the translators’ intent to each editions’s formatting. As a reference edition, the Quentel boasts four principal highlights: the elegant cross reference system at the bottom of each page, the brilliantly-executed concordance, the lined notepaper and the lovely maps. I have written in the past about how the designers at 2K/Denmark have hit one out of the park by moving the references from their typical center-column location to the footer of each page. Overly wide columns are the bane of single column text settings, because, when combined with small type, they pack more words on each line than your eye can easily scan. With a double column setting, the pitfall is reversed. If the column is too narrow, justifying the text will introduce too much white space between each word. Reference Bibles often suffer from this fault, exacerbated by the center-column cross references. By treating them as footnotes, the Quentel gives its two columns as much room as possible, enhancing readability. In the digital age, we do not make nearly as much use of printed concordances as readers once did. If every concordance was designed like this, that would be a tragedy. It’s true that flipping from the text to the concordance takes you from comfortable 11 pt. type to the realm of the minuscule. Even so, I can still use the concordance without aid, despite the fact that my last prescription for glasses dragged me kicking and screaming into bi-focals. Even if I couldn’t make out the type, in this case, it is worth your time to reach for the magnifying glass. I have never seen a more beautifully designed concordance than what you find in the Quentel. The type is dark and crisp, though tiny, augmented tastefully by Scripture references in dark red. I love maps, but to be honest, I do not spend much time consulting the ones in the back of the Bible. As a young man growing up in the church, they were a great comfort during many a tedious sermon, but by now I have more or less internalized the layout of the Holy Land. Whenever the need arises to confirm a geographical point, there are always more in-depth references to hand than the standard set of Bible maps. For what it’s worth, I find the Schuyler maps excellent, at least as good as those in the back of the ESV Study Bible, and, of course, they are reproduced in a much nicer form (sharper printing on better paper). They do a fine job linking significant places to relevant passages in Scripture. 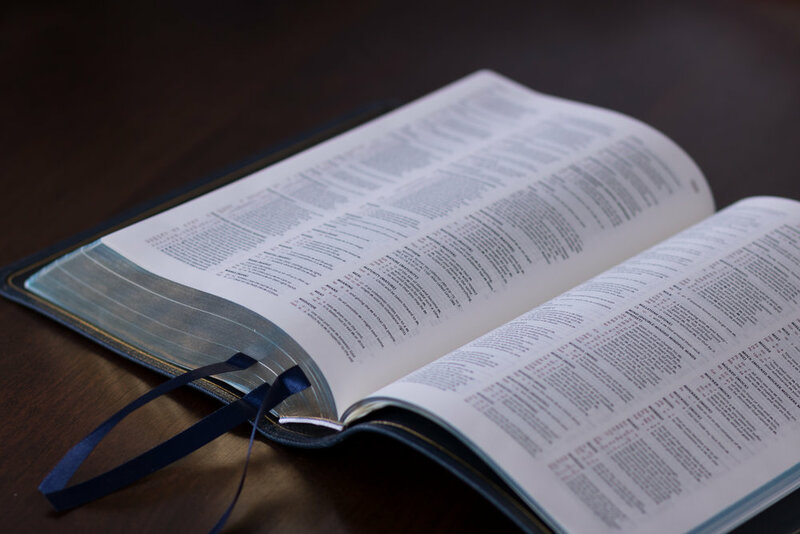 The Quentel NIV adds another feature that is not standard to the line, a benefit that comes with the New International Version. Where relevant, the translation lists parallel passages at the beginning of chapters, something publishers can choose to include or not. Schuyler opted in, and while the results are occasionally redundant — the parallel listed at the head of the chapter is frequently cited in the cross references — I found it worthwhile in a reference edition to have major parallels billboarded in this way. Thanks to a few unexpected delays, this piece has taken more than a month to write. During that time, a reader e-mailed to ask for recommendations for an NIV to give his fiancee as a wedding present. I sent some suggestions, including the Quentel, and that’s what he chose. While there were merits to other options, he said, the Quentel struck him as the most appropriate edition to give as a gift. That makes perfect sense to me. The Quentel is traditional in the ideal sense, combining what works from the past with the best of today. There is no part of this edition that has not been thought through intentionally, from design to printing to binding. Whether you like the choices made or not, you can know that choices were made. The details were not simply left to chance. Nothing happened by default. Schuyler has done a great job soliciting input from their audience, which has led to incremental improvements during the lifespan of the Quentel. They are turning this format into a robust system of reference editions, with sizes and translations to suit your needs. The NIV Quentel benefits from that pedigree, giving readers who use the NIV an excellent edition to carry and treasure. The Schuyler Quentel NIV is available from EvangelicalBible.com in a variety of fine bindings. The price as of publication date is $200.00 for goatskin bindings like the one picture here, or $130 for calfskin bindings. If you are not following Bible Design Blog on Instagram, you can start by clicking here: @bibledesignblog.